Eventing or Combined Training is the ultimate equestrian sport. It trains and tests the horse and rider to the peak of their talent and ability in three phases: Dressage, Cross-Country and Stadium. The horse and rider must be proficient in all three aspects of the sport in order to succeed. 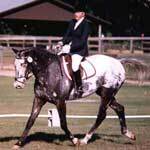 The Horse Trials is one of the competitions which tests the expertise of horse and rider. The Horse Trials comprises three distinct tests, usually taking place on one or even two days, during which a competitor rides that same horse throughout in a dressage test, a cross-country test and a jumping test. The trial is scored on a penalty basis. The final classification is reached by adding together all the penalty points incurred in the different tests. The winner is the competitor with the lowest total of penalty points. Dressage (a French word meaning training or schooling) as an equitation term, means the gradual harmonious development of the horse's physical and mental condition. The dressage phase involves the execution of a test exhibiting the precise obedience of the horse to the rider's commands - a display of complete harmony and understanding between horse and rider. Just as prescribed gymnastic exercises are included in a gymnastic competition, the dressage test is included to insure that the proper foundation has been laid for the broader demands of the complete competition. The object of the Cross Country test is to prove the speed, endurance, and jumping ability of the true cross country horse when it is well trained and in the peak of condition. At the same time, it demonstrates the rider's knowledge of pace and the use of the horse across country. The cross country test is a marathon for horse and rider who cover, at a gallop, natural terrain and encounter 12 to 25 obstacles, including water, ditches, banks, etc. It is a test of courage, stamina and complete confidence in one another. The object of this test is to prove that after a test of endurance, the horse has retained the suppleness, energy and obedience necessary for it to continue in service. The jumping test uses the final reserve of horse and rider and proves the willingness to perform to the best of one's ability.